Ever wondered what your portrait would look like on a pancake? If so, this campaign is for you. In celebration of the return of “All You Can Eat Pancakes,” IHOP commissioned pancake artist Nathan Shields to turn fan photos into real-time pancake portraits. Hosted on Twitter from 8 a.m. to 6 p.m. ET on January 15, fans could enter by tweeting @IHOP their photo with #Panuary. The results? One word: Impressive. The amount of detail makes the pancake portrait memorable—and instantly tweet-worthy. 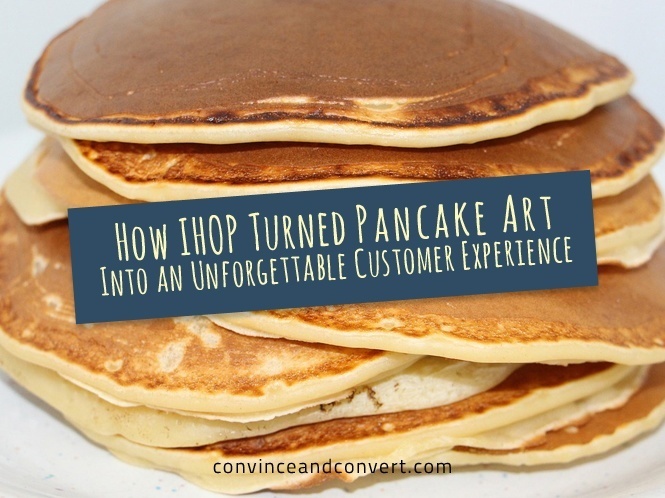 According to IHOP, the company received over 140 submissions in the first four hours and used 7.5 pounds of pancake batter to create the art. Images submitted for consideration included selfies, couples, pets, kids, celebrities, and more. Check out some of the pancake portraits this writer uncovered on Twitter. What can you learn from this artistic campaign? All you can eat pancakes are cool, but the chance to have your portrait on an actual pancake? That’s a memorable, shareable experience. In a time where there’s more competition for consumer attention that ever before, focusing on experiences is a key differentiator. Furthermore, a well-designed experience can generate more awareness and engagement around an announcement, while identifying brand or product advocates. According to IHOP, every freshly made-to-order pancake is a work of art that celebrates the company’s time-honored proprietary recipe. In order to bring its vision of pancake portraits to life, the company needed to bring in an expert. With these types of campaigns, it will not be a memorable experience if the deliverable isn’t up to par. Thanks to the internet, there are tons of amazing creators out there. For this campaign, IHOP tapped Nathan Shields, better known as SapianCakes on YouTube for creating epic pancake designs and portraits. The beauty of these experiential campaigns is their ability to identify advocates. In IHOP’s case, 140 submissions in four hours equals quite a few brand advocates. While not every entrant may have received a pancake portrait, tracking and tagging these participants presents an opportunity to build a relationship with engaged fans. Whether it’s lead gen for the company’s loyalty program, follow-up surprise and delight initiatives, or simply being there to respond to a question or complaint, the more companies prioritize knowing their customers, the more they can continue to deliver remarkable experiences.